Aldershot & District Dennis K3 fleet number 145 seen above at Alton Station, Hants celebrates its 50th year in preservation with Tim Stubbs by running an hourly service between Hindhead (145’s home garage) and Haslemere, Surrey, this coming Saturday, July 19. First departures are from Haslemere Station at 10:35am and from Hindhead National Trust Car Park at 11:05. Last departures are from Haslemere Stn at 4:35 and Hindhead at 5:05 for the full round trip, and 5:35 from Haslemere at 5:35 for Hindhead, Farnham and Alton. This is a small-scale event originally planned for friends associated over the years with 145’s preservation and running, so Tim asks me to point out that capacity may be limited, but 145 and 220 (Dennis K4) will be running trips the next day (Sunday July 20) at the Alton Running Day, Anstey Park, with frequent departures from Alton Station. Both of these deckers are unique survivals. 145 has a Dennis O6 engine (7.58 litres), vacuum brakes and Dennis overdrive gearbox; 220, dating from 1954, has a 1939 Gardner 5LW engine, vacuum-over-hydraulic brakes and Dennis o/d gearbox. The very different engines give them totally different characters. 145 is also unusual in having 8 rows of seats upstairs, each seating 3 except for a 4-seater at the front. 220 (East Lancs L28/28R) is a foot longer and 6" wider, also with 8 rows aloft, arranged as alternating 3s and 4s. Every month, for ten years, from the mid ’50’s, I used to get one of these buses from Woking Station to Botley’s Park Hospital at Ottershaw, then back: not a long journey, about 6 miles/30mins. How I looked forward to riding on them – their unique engine sound and that ‘U’ turn on the gear lever when the driver engaged overdrive. One distinctive feature of them was the unusually large width between the headlights, the same size and height, too. Thank goodness one has survived, looking so very kempt, too! Lovely to see an unfamiliar face even if it looks like a cousin of a Daimler CV. How does 220 end up with a 5LW, 25 years its senior? Dennis must be the great survivor, with an unfailing eye for a niche and a willingness to change, even if this includes ownership… but AEC, Leyland, Bristol, Guy, Daimler… where are you when we need you? Donald Stokes. First we gave him a knighthood then a peerage. That’s what we do in this country- reward incompetence. Sir Donald Stokes (knighted before the merger) was probably not the sharpest tool in the box for someone who was a company leader, although he was a good salesman, but taking over the newly-enforced merger of the ‘batty’ BMC, which should have gone into bankruptcy, was a poison chalice for anyone. Definitely a case of being between and rock and a hard place!! This was an era of strikes and mayhem at the best of times, mainly centred in the Midlands, with strong unions with leaders and shop stewards, like ‘Red’ Robbo, with Communist leanings, a Labour government which was always interfering with the running of the company, but never grasped the nettle of bringing in union democracy (despite Barbara Castle trying) adding more chaos to the brew! His peerage, in my view, WAS debatable. Joe. The Gardner engines came from 1939/40 Lances and Lancets when they were taken out of service. The engines were overhauled and incorporated Gardner approved updates to increase the BHP. Today this is called recycling! Is it my imagination or is the rear destination blind of GOU 845 offset to the nearside? If so, was this normal practice on Aldershot and District or just this batch of vehicles? 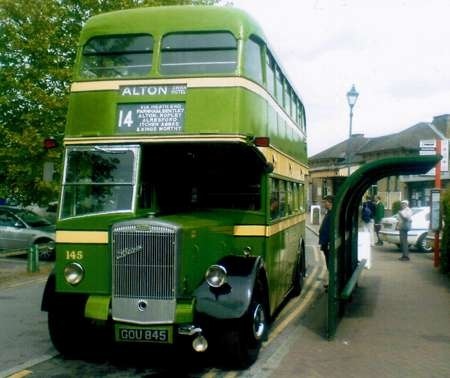 Aldershot & District route 19A was a summer service that ran four times a day beyond Midhurst, the normal terminus of the 19, onwards to Chichester and Bognor. Not a big user of the marque, Thomas Tilling, nevertheless, for Brighton town services, bought four Dennis Darts, then two Dennis Aces between 1932 and 1934. In 1935, they then bought six Dennis Lance II’s, adding Tilling bodywork in the style of their 80 London STL cousins. Here is 6315, standing, driver’s door ajar, at Brighton Station, not long after the war. It is blinded for Fishersgate (Portslade). Unlike its London cousins, it shows no trace of body sag! The radiator has the style of those fitted to the sweet little Dennis Darts of the early 1930’s and not the ‘Dutch Roof’ design, thick or thin, that had DENNIS across the radiator centre. This one has a small DENNIS plate below the radiator cap. Although it has the archaic triple window front upstairs, the larger BH&D blind box suits this front more than the ‘pinched’ LT style did. One change is that the rear upstairs emergency exit does not have twin windows that its London cousins possessed. All six were withdrawn in 1949. I’ve seen a few buses with the triple front windscreen arrangement, and they seem to have been London types for the most part, with a few CIE vehicles as makeweight. I can understand that the London ones may have fallen under the influence of the Metropolitan Police, but what about CIE? Did they simply like the design and stick with it for many years? Chris. Many thanks for the super photo of a BH&D Dennis Lance. It was news to me that they had any Lances, which were very uncommon in Tilling controlled fleets, as I can only think of the 1936 pair at Southern Vectis, with the later radiator. Perhaps this was due to Dennis persevering with the 4 cyl. notion of a double deck chassis, which most had, I believe, in petrol and/or 04 (Lanova ?) form. Dennis had supplied the Tilling group with substantial numbers of petrol engined Lancet 1 single deckers, and the standard small bus was the Ace, but with the advent of Bristols in the group,Dennis were keen to protect this business. Consequently, trial batches of Lancet 2s , with 04, or 5LW engines, were supplied, but as far as I can see, the only fleet to take any real number was Caledonian. What engines did these Lances have, and when did BH&D start to convert their AECs to oil engines? Indeed, when were their first Bristol Gs or Ks delivered? The Lances lasted well, did n`t they, especially as they were not so different from the London collection (DL class) which were all gone by about 1937, albeit a year or two older. More detail of the Brighton fleet up to 1950 would make delightful reading! The Lances of the later 1930s, as supplied to Walsall, and Merthyr, had very compact cabs because of their short 4 cyl. engines, theoretically enabling more effective use of passenger space, a bit like the Daimler COG5/40 concept. Fascinating stuff! These Brighton, Hove and District Lances were numbered 6311 to 6316, registrations NJ 5974 to 5979. The bus in the picture would appear to be 6315, NJ 5978. The pre war Lance never used the heavy style of radiator of the Lancet I, but the version used on these BH&D Lances appears to have been a slight variation upon the usual contemporary pattern which had a tapering grille set within a parallel sided frame, the bottom edge of which formed a shallow "V". Other Lance IIs, notably those of Aldershot and District, used the high set oval radiator of the Lancet II (and later III) which resulted in a decidedly restricted view from the cab. The Tilling bodies on three of the BH&D Lances, 6311/4/6, were rebuilt by Portsmouth Aviation in 1947, which made their withdrawal just two years later seem rather a profligate decision. I cannot establish if these Lances were powered by the 6.1 litre 100 bhp 6 cylinder ohv petrol engine or the 6.5 litre 85 bhp sixteen valve 4 cylinder O4 diesel, though, in view of the severe gradients in parts of the Brighton area, the petrol version would have been more likely. I don’t think that the three-window design would have been anything to do with the Metropolitan Police regulations. It’s notable that the LGOC effectively abandoned three windows around 1930 and all their Regents and Renowns had two windows, whereas Tilling and many of the independents continued to have three windows. I suspect that it had more to do with the need on buses without roller blinds for a large opening window for the conductor to lean out of to change the destination boards. By the time the Tilling STLs came out I suspect it was just a styling hangover. It is good that BH&D has been given an airing thanks to Chris H. 6315 was one of a batch of six Dennis Lances that were operated by BH&D and were the last petrol-engined double decker buses to join the fleet. They were converted to diesel as follows: – 6312, 6313, 6315, 6316 received Gardner 5LW engines between 1942 and 1946 and 6311,6314 were fitted with AEC 7.7 engines and radiators. When withdrawn in 1949, they were all sold to Westcliff-on -Sea Motor Services Ltd for further service. I do hope we will see more BH&D buses on this web site soon. The three window design for the upper deck was also used on pre war trolleybuses in Huddersfield Indeed a batch of Park Royal Sunbeams of 1949 also had this styling. Thx, Richard, for the additional info. If the condition of these vehicles is as good as seen in the photo, plus diesel engines, I’m not surprised that they were sold on for further service, Richard. Wonder when they finally went for scrap? Strange that they were re-engined with two types of engine. The fitting of AEC radiators to 6311 and 6314 was an unusual move. I wonder if changing petrol engines for diesels was a common action in the war. I’m not aware that it was. I was surprised to learn about the Gardner 5LW engine changes in the war period as I believe these were in very short supply and tightly regulated by the Ministry of War Supply. The Daimler Company had only a limited supply of 5LW engines for their production of the CWG5 model in 1943. I can only assume BH&D may have had a few 5LW engines in stock. I have no knowledge about the Dennis Lance operation in Westcliff but I believe the AEC engined Dennis Lances were converted to open top, so possibly ran for some time into the mid-fifties. 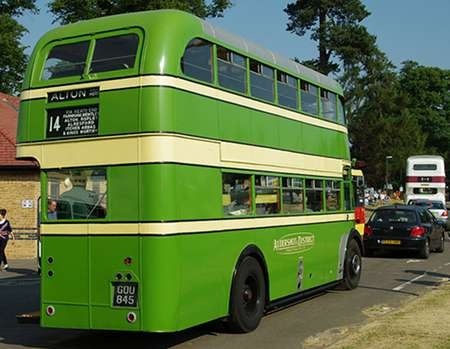 However another related war time matter that has always been hard to understand is how BH&D could store 7 new AEC 661T/Weymann trolleybuses from 1940 to 1946 when other towns and cities were in desperate need for trolleybuses. 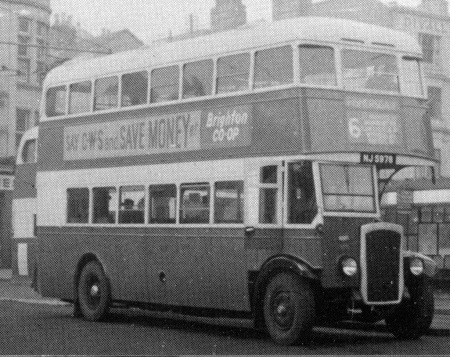 Brighton Corporation AEC 661T/Weymann trolleybuses were loaned to Newcastle during the war. 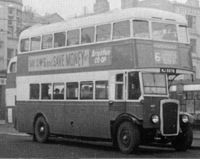 Another operator of buses with three windows at the front of the upper deck was Luton Corporation, who operated some pre-war Daimler COG’s with Willowbrook lowbridge bodywork thus fitted. A picture appears on this very site! (see Luton Corporation). A brief look at a fleet book I have reveals Luton operated several Daimlers of CH6, CP6 (petrol), and COG5 (diesel) types, all with Willowbrook L26/26R bodies. These had the lowbridge gangway on both nearside and offside, and were new from c.1933 to 1938, most surviving into post-war years, being withdrawn c.1948-1953. I believe the use of the double lowbridge gangway was originally used to avoid the patent payment to Leyland for their 1927 design, but I think that this was cleared by c.1933/34, so it’s continued use after that date must be operator preference / standardisation. Presumably the three-window upstairs layout suited the two-gangway/central seating block layout inside. Just to keep the record straight the SIX Southern Vectis Dennis ‘Lance’ double deckers delivered in 1935 had Gardner 5LW diesel engines from new. The six Lances [600-605] ADL 500-505 for Southern Vectis were delivered in 1936 with 600/1 arriving 29/5/36 and 602-5 arriving -/6/36. They had a hard life with SV especially during the war years but still managed to give 17 years service [600/2/4] or 18 years [601/3/5], so the last ones were still in use as spare buses when the first Lodekkas arrived! Apparently  survived with a Showman in Gloucester until November 1965. Any further news/photos of them welcome. Of the six Lances one, NJ 5976 was converted to open top (I think by Westcliff, not by BH&D) and used on the Southend sea front services. The others were used mainly(possibly entirely) on contract work. One later finished up as a store at Southend depot. Several later acquired AEC radiators. None received Eastern Nation fleet numbers in July 1954, so they must all have gone by then. I think (but cannot check, as I cannot locate my copy) the recent history of Westcliff has a photo of one with that company. Thanks Brian I have corrected the spelling of Westcliff. Further to my query posted above in August 2012, about how BH&D could store their new AEC661T/Weymann trolleybuses throughout the period 1939 to 1945, perhaps some correspondence from the LPTB to the BH&D Tilling Group may put some light on the matter. Michael Dryhurst has written a most interesting "What if–" article in "Classic Bus" no.130 April/May 2014 on these stored BH&D trolleybuses. It would seem the LPTB would have liked to purchase these BH&D trolleybuses in 1944 for use on their 654 Crystal Palace to Sutton route to relieve serious vehicle shortages due to serious war damage to Bexleyheath and West Ham depots. Richard highlights one of the most intriguing episodes of WW2 transport history here. Why were these vehicles stored throughout the war when there were chronic shortages all over the country? I too have seen the article in "Classic Bus", which is a fascinating "what if" scenario, especially as the B.H.and D. 661Ts had coasting and run back brakes, making them eminently suitable for LPTB. Perhaps the answer lies in their Crompton Parkinson equipments, totally non standard as far as London trolleybuses were concerned, but thanks, Richard, for bringing up this point. I’ve just found out that Westcliff-on-Sea took delivery of three Dennis Lances in 1931 (JN960/1/2), so there was a logic in their taking the BH&D ones. Incidentally, these also finished up with AEC radiators. Interesting about LPTB’s bid to buy BH&D’s trolleys. Obviously LPTB got by with their shortage in the end, since the only trolleys they ever borrowed were some Bournemouth ones earlier in the war to cover a shortage overcome by acquiring the South Africa-destined trolleys in the end. This picture was taken in Woodbridge Road, Guildford, about 1961, and shows one of the 32 "tin fronted" Dennis Lance K4 buses unique to the Aldershot and District Traction Company. The first 20 of these had East Lancs L28/28 bodywork of the type shown, and the final 12 were bodied by Weymann with a version of the Orion, again seating 56 with 28 on each deck. The Gardner 5LW engines in these buses were removed from withdrawn Lancets of 1940 vintage, but were rebuilt and updated to the latest specification to virtually new standard. As usual with A&D buses, these vehicles had five speed gearboxes. I never drove one of these, but I understand that, with their slow revving (1700 rpm) 94 bhp engines they were less than lively, and not popular with the Aldershot and District driving staff, who christened them "Lulus" from their registration letters. The motorcycle and sidecar combination overtaking the bus is entirely characteristic of those times and something that is never seen today. I cannot identify the make of motorbike, but it is certainly something of a veteran itself as it has girder type front forks. The same nickname was given by Samuel Ledgard staff to ex London RT LLU 803 – her thunder was somewhat stolen though by the later arrival of some RTLs with the same "Christian name." Despite the cumbersome and leisurely progress of the A & D Dennis Lance I have to say that it is an extremely attractive vehicle indeed – the characterful destination display and the beautiful livery of that operator being the icing on the cake. Aldershot and District always had a small engine policy, and it is difficult to understand why the Lance K4 should have been singled out by certain staff for a modest performance. The pre war Lances with the high set radiator style (as on the Lancet II and III) were delivered with Dennis four cylinder sixteen valve O4 engines of 6.5 litres giving 82 bhp. Most of these early Lances were later rebodied and refitted with 5LW engines, and the wartime Guy Arabs also had the 5LW powerplant. The first postwar ‘deckers were Lance K3s with the Dennis O6 of 100 bhp, and these were lively, smooth running buses, and the following K4s of the type shown above must have seemed much more sedate by comparison. Then came Lolines powered by the 6LW engine, and it is probable that, by a certain point in time and within the experience of some drivers, the Lance K4s were the only double deck buses in the fleet still using the 5LW. My experience of the K4 as a passenger indicated that its road performance was fully up to the general standard of the time. Happily, Tim Stubbs and Malcolm Spalding rescued sister ship A&D K4 220 some years ago, and it has been a regular at running days and other events for at least seventeen years. I’ve had the very good fortune to be on the driving rota, and it really a most characterful bus, with the reassuring thump of the 5LW and the unique 5-spd gearbox, with 1st, 2nd and 3rd sliding (not constant)mesh and preselective overdrive. The cab is not a model of comfort or convenience, but the steering is a joy. Brakes are vacuum over hydraulic, and seem to need frequent adjustment but are wonderfully progressive in action. Seating is 28 on each deck. On top, counting from the front, the seats are for 4, 4, 3, 4, 3, 4, 3 and 3. Even on a 27-long body eight rows upstairs was still less common than seven on mid-fifties lowbridge bodies but—as on contemporary Roe lowbridge products—the back seat upstairs is set as far back as it can be without compromising staircase headroom, so there’s plenty of knee room between seats. She’s admittedly slow in hilly country, but will do 48mph on the flat and on a well-chosen route puts the miles behind her surprising quickly. Tim’s K3 of 1950, with the Dennis O6 engine, is 6" narrower and a foot shorter but is actually slightly heavier than the K4. Unlike the 5LW, the amazingly smooth O6 is a spinner, not a slogger. The difference in engine gives the two otherwise very similar vehicles a totally different character. The 5LW demands a well-adjusted clutch-stop, but the lighter flywheel of the O6 makes it unnecessary for upward changes—except 1st to 2nd on hills. These two vehicles are wonderful survivals, and it’s a pity that none of the lightweight (and apparently very lively) Weymann Orion-bodied K4s survived. When I first saw one at Reading Station the pop-rivets put me off. How could my schoolboy judgment have been so flawed! There should be Dennis delights at Alton Running Day, Hampshire, this July the 17th, and the big event is 100 years of Aldershot&District at Farnborough, Hants, Sunday May the 27th 2012. Roger, I’m equally envious of your youthful rides on 04-engined Lancets. From what I’ve heard, they were livelier than one might expect from only 6.5 litres. I believe one is preserved and I very much hope one day to have a ride on it. I used to think the days of four-cylinder engines powering full-size buses were behind us, but the new Alexander-Dennis diesel-electrics in Reading, Oxford and Manchester seem to manage very nicely with their little fours. When I worked at Smiths in Reading there were still 04 engine bits in the workshop, although the last 04s were probably off the road by 1960. The only Ace I’ve ever ridden on in genuine service took me from Yarmouth to Freshwater, Isle of Wight, but the sound was all wrong as it had a Bedford OB engine and gearbox. I can see why Crossley had for legal reasons to hurriedly redesign the Saurer combustion chamber, but I wonder why at the same time they abandoned the 4-valve head? That surely wouldn’t have infringed any patents. The Reading downdraught-engined Crossley deckers were certainly slow, with their UW of 8.3.1, and they tended, oddly, to be used on the hillier routes, but they lasted for 18 years, so the workshop must have got a feel for keeping them happy. Ian, your comments on Dennis and Crossley machines has prompted me to add a few more. My memories as a four to seven year old might now be optimistically tinged with nostalgia, but I do recall the curious muffled drumming sound of the Dennis O4 engines, very different from the local Maidstone and District Tigers (petrol and diesel), but the progress was very smooth and lively. I loved those old Dennis Lancets, and the high mounted radiator offset to the nearside denoted a truly independently minded manufacturer. The later Lancet III was surely one of the finest vehicles of its time. I have some b/w pictures of three Smiths of Reading Lancets that brought a private party to Hampton Court in 1961. I will send them to the site in due course. Still with Reading, I have a few pictures of that operator’s all Crossley DD42/8 machines which, as you say, were fitted with the downdraught engine that represented AEC’s attempt to mitigate the abysmal characteristics of the HOE7. I took the pictures in 1967 by which time the Dennis Loline reigned supreme in the double deck fleet. Having moved to the Gosport area when I was nine years old, I frequently saw the Portsmouth Crossleys in service, but I never travelled on a bus of this make until 1958, by which time I was living in the Croydon area. This was the year of the seven week London bus strike, and an outfit grandiosely calling itself "The People’s League for the Defence of Freedom" obtained permission to run some routes during the stoppage. One of these was route 2 between Croydon and New Addington, and two of the four buses allocated were ex Lancaster Corporation all Crossley SD42 (the others were an ex Crosville TD7 and an ex Lytham St Annes CWA6). Admittedly the Crossleys were 11 years old by then, and always well loaded, but I was amazed by the truly mediocre hill climbing performance of these machines. I have a picture of HTC 614 at New Addington taken with my trusty Brownie 127, and will send it in sometime. The strange thing about the Crossley HOE engine was that they never cured, or bothered to cure, the breathing problems that became apparent with the conversion to two-valves per cylinder. Yet, when AEC took them over, the problem was sorted out quite quickly! Chris, judging by the comprehensive "Crossley" book by Eyre, Heaps and Townsin, the Crossley Motors company did not take kindly to external criticism, and any that was forthcoming merely served to strengthen the firm’s intransigence, a very curious attitude to adopt in a fiercely commercial environment. Thus, not only did it take no meaningful action to solve the shortcomings of the HOE7, but it appeared to resent the AEC solution that appeared as the downdraught engine, even continuing to supply unmodified HOE7 engines in new buses. 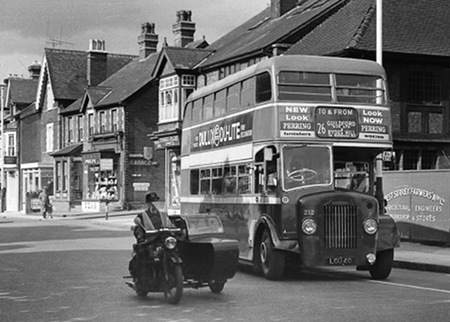 A similar cussedness was displayed in respect of the steering geometry on all Crossley buses. A simple readjustment in design would have cured the exceptionally heavy steering characteristics, that, in the case of the three axled "Dominion" trolleybuses, bordered on the impossible, but Crossley would not shift its position. No wonder AEC got fed up. What amazes me about Crossley is the difference in attitude between their chassis and body departments. Whereas the chassis people stuck stubbornly to their own ideas come what may, their first standard postwar body was designed not by Crossley but by Manchester Corporation. The special Manchester features – curves, waistrail steps and cantilever platform – quickly became optional, and even the first Liverpool bodies were actually the de-Manchestered Manc design reworked as a four-bay body with a flat front, as required by the Liverpool spec. I don’t think Crossley ever designed a double-deck body from scratch at all, although their postwar framing system was all their own. Thank you Roger and Peter, for mentioning the diverse attitude of the two parts of Crossley, one self-serving and the other accommodating towards its customers. As we know, a chain is only as good as its weakest link! Talking about Track routes to this day the Arriva service 268 Dewsbury- Bradford service is still referred as the Track although in tramway days the service only went as far as Moorend as did service G in bus days.The service 281 Bradford to Thornhill is always referred as The Donkey for obvious reasons. Roger, in his copy, records that these vehicles had five-speed gearboxes, but I seem to recall that they had four-speed boxes with overdrive. The driver would move the lever in a semi-circular way to gain overdrive. I only travelled on them from Woking to St. Peter’s Hospital, Ottershaw, a very flat route, so was never able to judge their hill-climbing capabilities. When living in Portsmouth, I did travel on the Petersfield – Guildford route as far as Milford on a couple of occasions, but that was on a Loline. I imagine that the Lances would also have been on that challenging route over the North Downs and I’d have loved to have ridden on them up there! A childhood delight was going on holiday, around 1950, from Kingston – Southsea on a duplicate Southdown Leyland Cub coach. But I digress! Oh, there you go – as Chris Youhill has said elsewhere, that’s the fun of this site. Digress away. After the pathetic failure that was yesterday’s Cobham/Wisley event, we may only be left with our digressions! Well, the weather must have been appalling, if Gloucester was anything to go by, but were there other problems, too, David? Chris, the Dennis gearbox was an overdrive unit, giving five gears in all. Overdrive was a preselective gear designed using Maybach principles. To engage from fourth, the gear lever was moved at any time, as with a conventional preselector, to the left and forward, and actual engagement occurred when the accelerator was released to allow the revs to die. When the accelerator was pressed again, fifth gear was already engaged. To change down, the lever was moved back to the fourth position, and engagement occurred when the accelerator was released and then pressed again to raise the revs for the fourth ratio. Sadly, I have never driven a Dennis with such a gearbox, though I have travelled many miles as a passenger on Lances and Lancets so equipped. Ian T is the expert when it comes to practical experience. Is that Arthur and Olive from On the Buses just passing? We were discussing this on Sunday, Chris, saying that the organisers might use the weather as an excuse. The weather was atrocious – but that wasn’t the problem. Most of the "runs" were a circuit of the airfield – not a decent run on proper roads. The 499 to/from Weybridge Station was supposed to be half modern low-floor vehicles – it was even worse. More of them, supplemented by re-engined RMs. I have friends "high" in the industry who said after Dunsfold, and then this, they will no longer be supporting it. Likewise people in the business who are enthusiasts who brought their own vehicles from wide and far. We were charged £10 to enter, get soaked and find nothing to entertain us – and a further £2 for the programme. Sorry you got me going Chris, but it wasn’t the weather and, despite living up the hill, it won’t be in my diary next year. Rant over, now let’s get on with friendly sharing of expertise and experience.